These are alot smaller then the piccie implies. I found one today. It shocked me because I didn't think I'd see one period. Any stag beetle really. 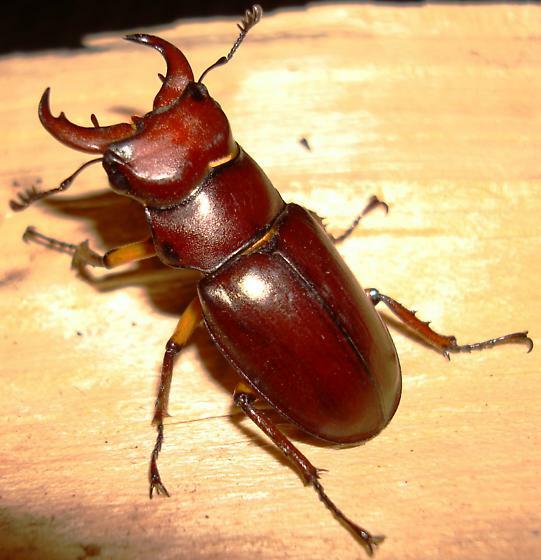 Upon further research I've also had a revelation that all the beetle grubs I have seen over the years might have been Lucanus capreolus..........and now I find an adult male. Found at lights, at bait, and around decaying logs, stumps, where it breeds. Males use mandibles to fight at breeding sites. Eggs are deposited in rotting wood. Larvae live in decaying wood of deciduous trees. They take two years to develop, pupate in nearby soil. I will look into it though......for next year of course. *^^* Will be digging up additional information on these later possibly for another entry......who knows? These look like they could be painful if they got a hold of you or your pet. Let this pest control portland company help you with them.